If you’ve read some of my reviews in the past, you’d likely know that I’ve long been a fan of Japanese RPGs. As gaming became a form of both escapism and virtual tourism during my formative years there was no other genre that fill the bill quite as well or was as easily accessible. Because of this, a lot of my fondest gaming memories are of poring hours upon hours into the genre’s rollercoaster narratives and massive worlds. As I’ve gotten older my tastes in games have expanded and my free time has dwindled, and subsequently I began to drop away from a genre that once brought me so much enjoyment. In the last year, however, I’ve started to be sucked back into the types of worlds that once dominated my energy and life. I’ve gone on record with my positivity and love for Xenoblade Chronicles 2, Ni no Kuni 2: Revenant Kingdom and Octopath Traveller in the last year, but they are all different beasts to the RPGs of yore that once engrossed me so. 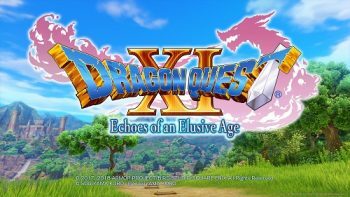 Dragon Quest XI: Echoes of an Elusive Age, however, is much closer to that same traditional RPG experience, albeit with modern trappings and some clever quality of life enhancements. 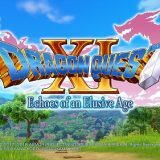 While this may make you think Dragon Quest XI is just another run-of-the-mill RPG, contained within its traditional trappings is a beautifully crafted world with one of the most heartfelt and well-presented stories I’ve seen. Dragon Quest XI’s greatest asset is its story and I can’t think of a better tale told in an RPG from the last couple of years. In Dragon Quest XI you take control of the Luminary, a holy warrior born when the Dark Lord begins to rise again and the World starts to plunge towards darkness. If that premise sounds tropey and overdone, it’s because it genuinely is, but the story that unfolds around that overdone premise is what makes Dragon Quest XI’s narrative truly special. Early on, the rug is pulled from under your feet as you are decried as darkness personified instead of the rightful saviour of the world. This thrusts you headlong into the deep end, with little understanding of how to save the world or harness your powers, leaving you in a world filled with mystery that you have to explore and learn about as your quest progresses. Stories in videogames, and especially in RPGs, are known to be overdramatic and lack subtlety when handling even the lightest of story beats. However, while Dragon Quest XI can be guilty of this in places, this couldn’t be further from how it handles its more dramatic, tragic and sometimes outright depressing events. 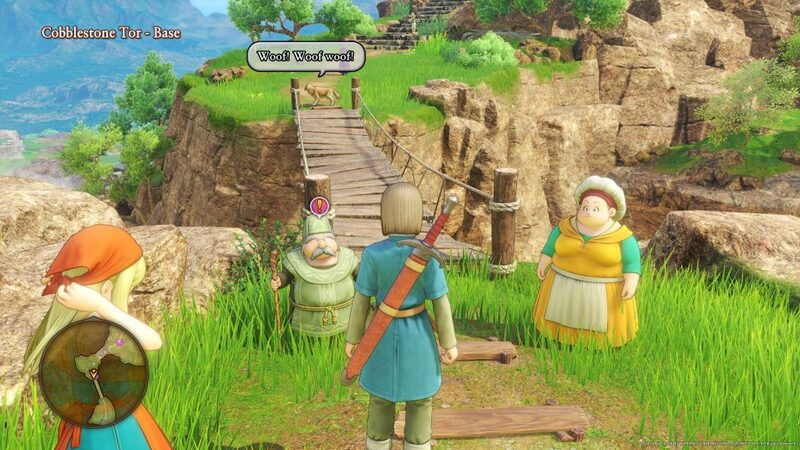 At times where other games would bring a ham-fisted dramatization to their more poignant moments, Dragon Quest XI brings a soft touch and respect that drew me in and legitimately moved me. While its handling of these moments impressed me, it’s the characterisation of the world’s inhabitants that truly make this possible. As each character enters your party you’re presented with a general understanding of their personality, and sometimes a glimpse at their backstory, but these initial impressions belie their true depth. As your journey progresses you will gradually learn more about your party, be this through direct conversations or subtle hints dropped by seemingly unrelated NPCs and narrative moments. Your understanding of each character, their history and their motivations will grow as you experience more of the game and it is this growth that led to my strong attachment to them. There is not a single party character that I disliked in the game, although I would be lying if I said I didn’t have favourites, and that is an extremely rare thing for me to say. Even some of the major NPCs in the game showed more genuine character growth throughout its narrative than protagonists in other games, with Queen Marina being my personal favourite example. As a series, Dragon Quest has created an extremely consistent and recognisable art style, largely due to having Akira Toriyama design the characters throughout its entire history. 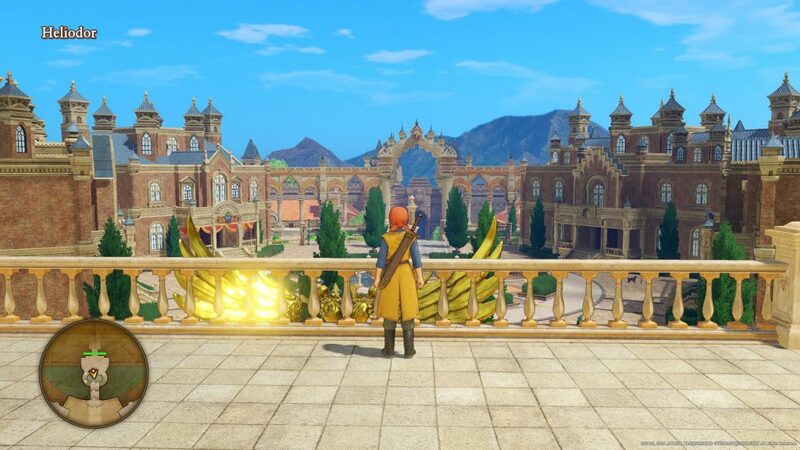 Because of this the contents of a Dragon Quest world are largely predictable, but the technical and artistic beauty with which they’re presented in Dragon Quest XI is anything but predictable. The game features a stylised and cartoonish art style, but this is presented in an incredibly detailed and technical manner that I haven’t seen before. The best example of this is in the game’s monsters, where series stalwarts like Platypunks and Slimes are instantly recognisable, but also look better than they ever have. Early on in my time with the game, before I remembered that deadlines exist and that I’d better hurry it up a bit, I deliberately ran into battles just so I could stare at enemy models, often shouting across the house to my wife to come and look at the latest wacky monster I was fighting. The same can be said for the game’s environments, which are spacious, interesting and filled with detail wherever you look. In a world where Square Enix once spoke about how difficult it was to create large towns in HD, it’s amazing to see large, detailed cities to explore. Dragon Quest XI is nothing short of beautiful and is easily one of the best-looking games of the year. Unfortunately, I can’t quite level the same praise at the game’s music, which is presented as MIDI tunes instead of the orchestral work found in other games. While the specific reasons behind why the game doesn’t include the orchestral score we know exists aren’t clear, what is clear is that it has hampered what would otherwise have been an amazing score. This isn’t to say that the music in Dragon Quest XI is bad, in fact I would say that it’s still better than the music in many other games, but that it’s hamstrung by an artificially reduced quality that pulls it down. In fact, you’re reminded of how much better it could have been every time you boot the game, as the intro movie is accompanied by an amazing orchestral performance of the series theme song. While the music itself suffers from this reduced quality, the same cannot be said for the voice acting, which is largely of a good quality, but less important characters tend to suffer from stilted delivery and even disinterested tones on occasion. Neither of these are deal-breakers, but they’re below the high quality of the rest of the game. As far as RPGs go, Dragon Quest XI’s battle system is one of the most traditional you’ll find, at least on the surface. Battles are turn-based, with no visible ordering, and characters have limited inventories, but this is where tradition ends. First, there are no random battles. Instead, enemies litter the field ahead of you, allowing you to choose what enemies to battle instead of relying on random chance. Once battle begins, by default, you’re able to freely move your characters around the battlefield, although this has no actual impact on the battle. However, I highly suggest swapping to the ‘classic camera’ option instead, which uses automated dynamic camera positioning and set character positioning to create more dramatic battle sequences. Each character has a range of abilities and spells at their disposal, with these increasing automatically as you level up, as well as being able to spend skill points to unlock more. As you unlock more abilities and spells you’ll also unlock more Pep powers – think trance states in Final Fantasy IX. There are no specific requirements to trigger Pep, although taking and dealing damage seems to be key, but once activated your character receives a stat boost and has the ability to perform powerful combo abilities with other party members. These can range from massive buffs to the entire party to devastating attacks, all of which have the power to turn the tide of any battle, especially considering many bosses are also able to utilise their own Pep powers. The true tradition breakers however, come from the quality of life improvements that have been made to the battle system and the game as a whole. 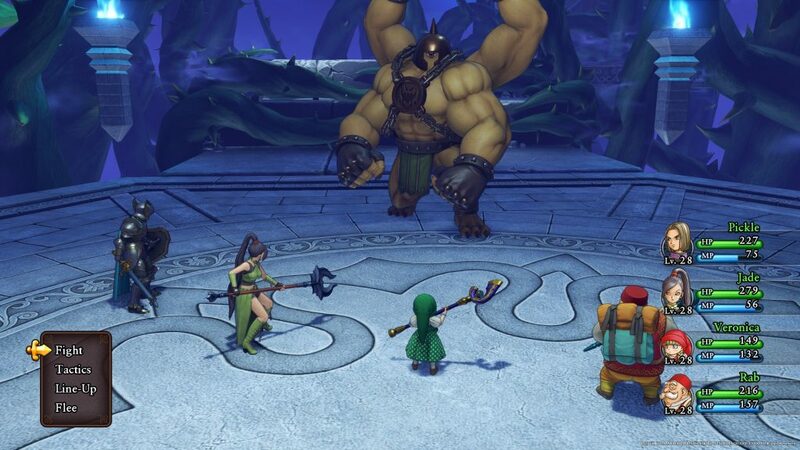 You can freely change the line-up of characters before battle and whenever one of your party members is taking a turn, leaving you permanently able to mix up combat whenever you see fit. Your entire party can be set to run on a variety of AI commands if you wish, or you can take manual control of them. Personally, I largely ran the party on full AI at times when clearing through basic enemies while swapping to manual controls for more involved battles. You can freely avoid enemies, with the game’s sprinting speed being fast enough to outpace any enemy you find, meaning that you’re rarely forced to engage with enemies outside of boss battles. This is coupled with a difficulty that allows you to run through the game while keeping grinding to a minimum, leaving you with more time to experience the narrative and helping to limit burnout over the course of the game. Characters all have a range of abilities and weapon types you can spec them towards and skill points can be easily and cheaply reset, allowing you to experiment with your characters until you find the mix that feels right to you. Individually, these are all small changes and adjustments to a standard formula, but together they create an experience that feels new and fresh, and actively allows you to tailor your in-game experience to your personal preferences. Finally, there are two more aspects of Dragon Quest XI that I loved and are intrinsically intertwined by their design- Side Quests and the Fun-Sized Forge. 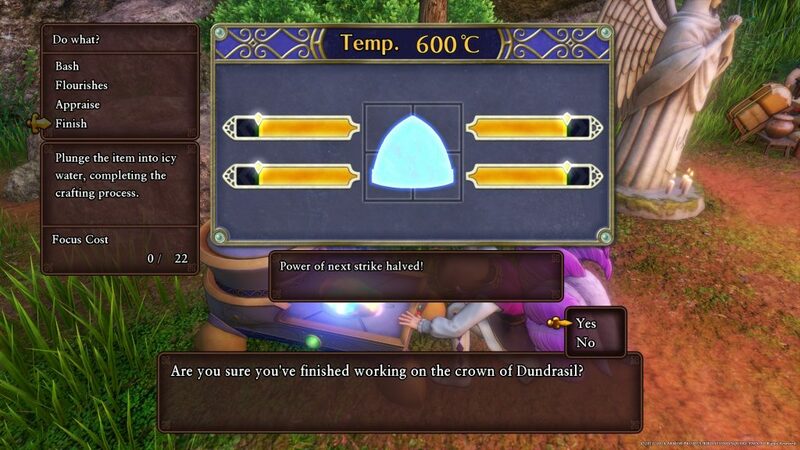 Crafting is one of my most loved parts of any genre, and is largely behind my love for Far Cry and Fantasy Life, and it is present in spades in Dragon Quest XI in the form of the Fun-Sized Forge. After a certain point in the story, you’re given the option to use the Fun-Sized Forge whenever you make camp, allowing you to craft weapons, armour and accessories from the recipes you’ve found during your adventure. That sounds simple, but crafting in Dragon Quest XI is an active system, as opposed to passive, where you have to bash molten materials into usable equipment. 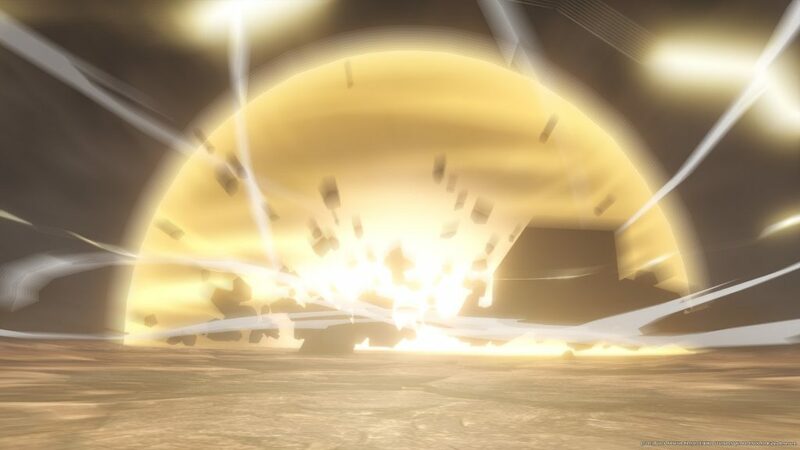 This takes place as a small mini-game, where you can bash, use special techniques that allow for multiple hits, increased critical hit chances and more, as you attempt to fill multi grid-meters to a certain point to make better equipment. As the quality of equipment grows, so does the difficulty of the mini-game, forcing you to think strategically as you work out the best way to complete equipment before your stamina runs out. You’ll often be able to craft higher quality equipment than what you can find in stores in the game, so you’ll definitely want to engage with it regularly. Without recipes though, you’re not going to be making anything, and that’s where the games side quests come into the equation. While you can find recipe books in treasure chests and bookcases throughout the game, you’ll also gain a large number of them – as well as a large amount of great equipment and items – by completing side quests. Unfortunately, the game’s side quests are largely rote experiences that don’t change much as you progress through the game. You’ll generally need to kill a certain monster, sometimes with a specific Pep power, deliver something to someone in another town or find some specific items. However, while their design is somewhat uninspired and gradually become boring, the rewards they give generally make them worth engaging with. This is especially true early in the game, where some of the weapons you gain – and recipes to make them – are multitudes stronger than anything else you’ll find at that point in the game. There is no doubt that I was interested in and excited by Dragon Quest XI before playing it, but I was not prepared for just how much I would love it after completing it. While I would have loved some more creative side quest design and an orchestral soundtrack, the captivating narrative, loveable characters and quality of life improvements greatly outweigh them. There is no doubt that, in my opinion, Dragon Quest XI is the greatest Japanese RPG of this generation and is well worth your time if you have even a passing interest in it or the genre.